Designed to withstand the rigours of terrierwork and for ease of use in cold, wet and muddy conditions. High strength polycarbonate casing and thermoplastic rubber cover for toughness in the field. State of the art electronics are supported by nitrile rubber for shock absorbtion to help prevent damage to the circuit board from impact. With superior accuracy and a steady, high visibility number and directional arrow display, it is less susceptible to interference. 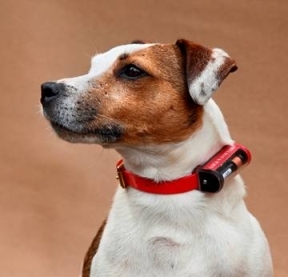 The device is designed to locate the transmitter collar with pinpoint accuracy, particularly at close range. 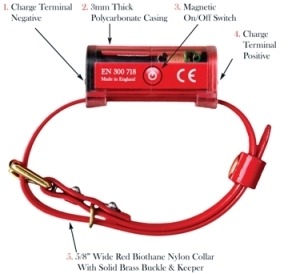 The most up to date Lithium Polymer rechargeable battery technology, and the military specification On / Off switch which is completely smooth with no moving parts allows the casing to be fully sealed against water and dirt penetration. Tested extensively all last season, the receiver is designed to be used with B&F Transmitter Collars. 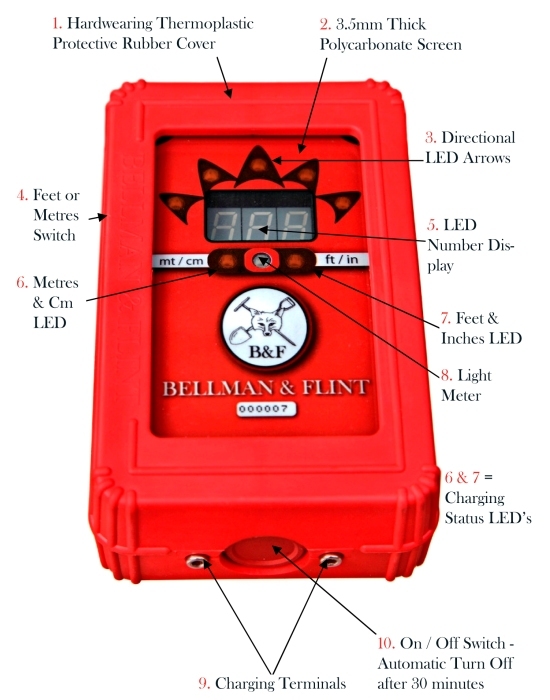 Exclusive Manufacture, Distribution and Service from Bellman & Flint . All products are available to purchase By Mail Order or Buy from our shop. 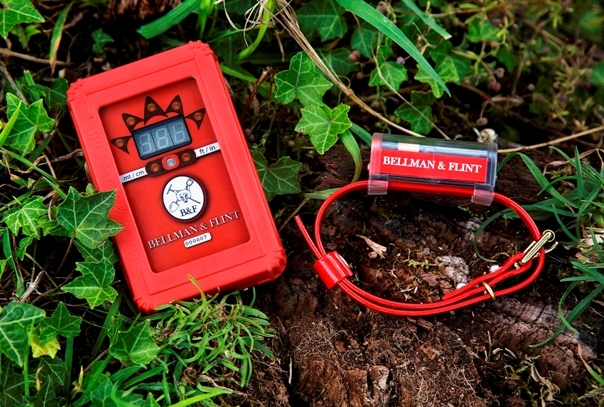 Bellman & Flint DT457 Rechargeable Locator Collar The transmitter collar is designed to sit on the side of the dog’s neck. The circuit board is supported by shock absorbing nitrile rubber and is encased in a fully sealed 3mm thick Polycarbonate casing. Three coloured LED lights indicate the charging status and remaining battery life. Using Lithium Polymer rechargeable battery technology gives a 40,000 hour battery lifespan. The collar is made of 5/8” wide red nylon Biothane which is tough, water resistant and easy to clean. The collar has a solid brass buckle and keeper, with an additional keeper for security. Extensively tested over a number of seasons, the B&F transmitter collar gives supreme reliability and accurate location.